2. During the next 10 days (Jan 29 – Feb 7th) we will ask you to visit 44 of the HOTTEST scrapbooking manufacturers on facebook LIKE their pages or FOLLOW their blogs. Joining their communities will keep you informed of all things good in the scrapbooking industry! What will you win – A TASTE OF Creativation sample pack worth over 1000.00$ of the latest products by our 44 AMAZING sponsors!!!!! WOWZERS! #1 – Chameleon Pens The ten 5-Pen packs are a great way to get into the Chameleon Color Tones range. These packs are made up of the 50 Chameleon pen colours, broken down into 10 individual sets; Pastel Tones, Primary Tones, Earth Tones and Cool Tones to name but 4 of them. Each pack is complete with detailed instructions that have useful hints, tips and techniques. Prize package includes a set of color cards. Picnic With You Photopolymer Bundle from the Stampin’ Up! Occasions catalog that just launched! #3 – Ranger The Dylusions Creative Dyary is the perfect combination of weekly planning, and art journaling! The Dylusions Creative Dyary includes weekly agenda pages, Dylusions backgrounds, and colouring sheets for on-the-go creativity. Featuring the same great Mixed Media Cardstock found in other Dylusions Creative Journals in a lighter weight. #4 – Scrapbook Adhesives by 3L One stop shopping for all your adhesive needs! 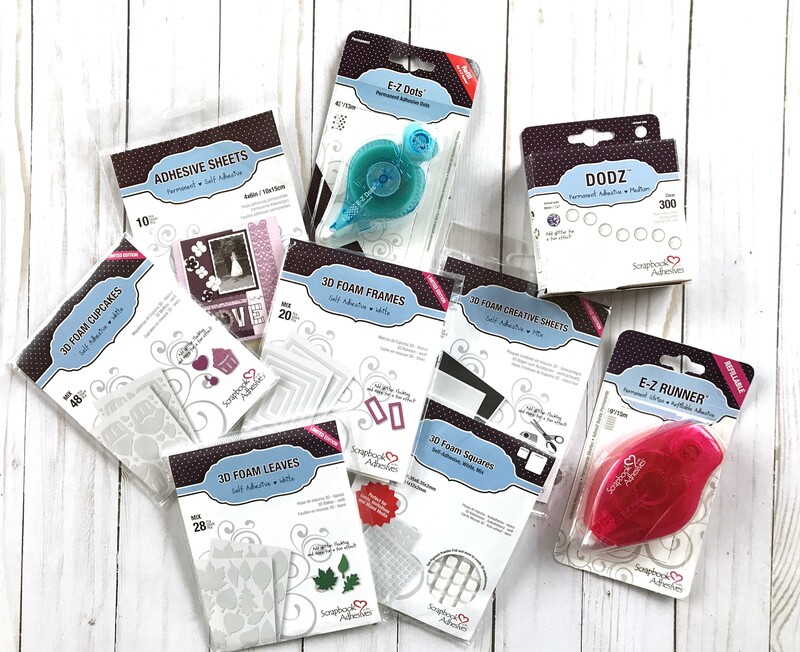 From tape runners, to photo corners, to 3D foam squares and tape, to 3D foam shapes, Dodz and MORE! You will love finding this in your prize package. #5 – Momenta Look at all this scrapbooking LOVE from the wonderful people over at Momenta. Burlap flowers, doilies, chipboard words, decorative cardstock and MORE! Oh the things you will create with this FABULOSA selection. 1. After visiting todays featured sponsors – liking them on facebook or following their blogs – come back to the Creative Scrapbooker Magazine Blog and post DONE under this post. A Taste of CreativationChameleon PensContestsgiveawayMomentaRangerscrapbook adhesives by 3LStampin' Up! Amazing amazing products. One can only hope to win over $2000 in prizes with so many great products. Allllll done! Day #3- Yipppeeeeee! Done adhesive dies and chameleon markers Heaven!!!!! More great companies! Thanks for the chance to win! DONE! Some of my longtime favorites today, with fab new goodies!! Done. Another great range of prizes. I seen and saw that Ranger and Tim Holtz has released some exciting new products! Can’t wait to demo them. Thank you for this amazing giveaway and the opportunity to discover new fabulous brands like Momenta that I didn’t know today. Done for today. Looking forward to tomorrow. Done. Love all these companies, like them, and follow them. Feels like Christmas all over again. WOW! So many wonderful sponsors and products. Thank you for the opportunity to win. Done Done Done! These sponsors are amazing! Thanks CS! Hi finished day three DONE! Such great prizes from great sponsors! Done. Done! So many great prizes. Wonderful day once again. Thank you CSM. Done and wow! More and more amazing companies! Done. I sooo want to try these Chameleon markers!!! Done, thank you for another day of great prizes! Done!! !Getting excited for these products. Already like them. And I love Adhesives by 3L! DONE. I actually found one I wasn’t already following. I have to say I’m loving this; expanding my knowledge and understanding of so many companies that love what I love and provide the resources I need (want)! DONE with Day 3! Day three done. My goodness what a lot of clicking but I plan to continue lol. What a nice giveaway !! Would love to win !!!! Done ! Thanks for the chance. Done…thanks for the opportunity to win! Done! More fabulous sponsors and products, what a wonderful giveaway this will be!! day three is done! thanks for the opportunity to win such a tremendous prize package. can only hope! This is great…thanks so much!!! DONE!!! thanks for all the amazing giveaways! Done (again, have posted thanks on the pages where I can). Done! But I already ‘liked’ and follow their sites for months. Hope that still qualifies me to win this contest. I love my Creative Scrapbooker Magazine! I also love all of the wonderful prizes from the amazing crafting companies! This is a wonderful bundle of goodies! DONE, Awesome co’s and prizes. My fingers are itching to try these products. Thanks for more great giveways. I’m done Day #3. I’ve just ordered a set of the Chameleon pencil crayons. It would be fantastical to win a set of the markers, too. Thanks for always putting on such great contests. Done! So wish I could have been at Creativation! Day 3 – already a follower! Thanx ever sooo much CSM. Done! Awesome package of give aways. Like like and mega like. Done! Would love to win! Done, & thanks for the chance to win. Wow! What great companies. Following almost all of them already thanks to you. Done! Done. Love this to connect with companies new to me. Done. Thanks for the chance ! Great stencils. Hope I win. Done! Love these products so much! what great products today. thanks to the sponsors and magazine! Done! ll my faves in one day!! Done! So many great sponsors! I forgot to put DONE!!! !